I was recently involved in a software release where some rather unfortunate defects made their way to production. This resulted in some (not unreasonable) tough questioning from our stakeholders. One particular area they wanted to ask about was our testing practices. Were we not testing our product the same way their user community used it? 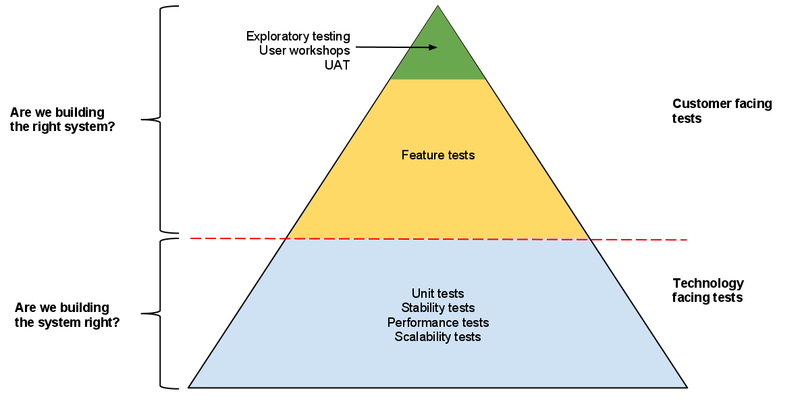 This highlighted an important disconnect in understanding the variety of types of testing that a responsible, professional team would usually employ to thoroughly test a product. If I were to do this again I’d probably separate out a bit more the different types of testing in the lower blue section for better emphasis of each, but you can get the gist of things from it as is. As you can see, I’ve classified the testing appropriate for our product in quite a few different ways. Understanding what these all were, how they differed and why each different kind was necessary was (it became apparent) difficult for our non-technical audience to easily understand. Why so many different kinds of test? This too was a puzzle for some. The idea I came up with to explain this was that, just as a doctor may need a wide variety of tests to diagnose a patient, so too we need a variety of tests to check the "health" of our software. The analogies below are all based around the idea of building cars. They might be a bet stretched, but I hope they're useful. Inspecting each component in isolation. Confirm the building blocks are fit for use in the bigger system (car). Checking all features behave as expected, e.g. does it steer properly, doors and trunk open properly, seats adjust etc. Driving around a racetrack, time trials, checking how fast you can get from 0-60? Getting the public to try it. Driving around town, down the highways, mountain roads, 4WD roads, dirt roads, etc. You hope to find unexpected things. Giving each car that comes off the production line a quick drive. 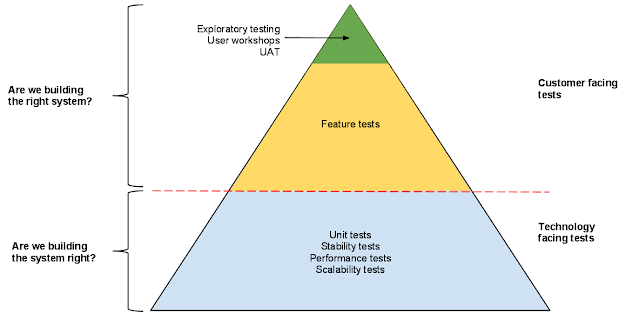 A great overview of testing that is easy to digest due to the simplification of the subject. Impressively the clarity is not attained through dumbing down the subject at all which is difficult to achieve. Thank you Jon, I would like to use the image in one of my presentation with appropriate image credit. Sure thing! Glad it's of some use.